05-10-2018. Picture Michael Gillen. FALKIRK. Falkirk Stadium. Falkirk FC v Dunfermline Athletic. SPFL Championship, Scottish Championship, Ladbrokes Championship. Myles Hippolyte 15 shot saved on to the bar by Leo Fasan 1. Falkirk failed to build on last weekend’s win over Alloa as they fell to a 2-0 home defeat to rivals Dunfermline Athletic. 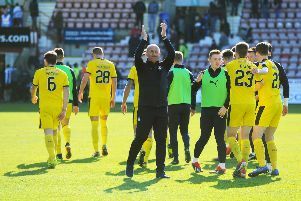 Pars keepers Lee Robinson was not called in to action during the 90 minutes as Andy Ryan and former Bairn Myles Hippolyte netted the goals to condemn Falkirk to seventh league defeat of the season. Ray McKinnon made one change to his side as Jordan McGhee came in for Paul Paton while new signing Prince Bauben was not involved in the match day squad. The atmosphere was electric at kick off with the Pars support in the North Stand and the Falkirk fans in the South doing their best to drown the other out. However by half time the Falkirk cheers had turned to boos after the visitors dominated the opening 45 minutes. Leo Fasan had a busy afternoon and was first called upon on 20 minutes when he palmed away a Faisall El Bakhtoui shot from 15 yards which was then cleared away. Lee Ashcroft headed wide from a Malaurey Martin corner as the visitors continued to push for an opener which eventually came on 40 minutes. Louis Longridge crossed the ball from the right and Andy Ryan met it at the near post, Fasan got a hand on it but the header was too powerful for the Italian and Dunfermline had a deserved lead. Falkirk made two substitutions at half time with Marcus Haber and Tommy Robson replacing Joe McKee and Dennon Lewis. Faisall El Bakhtoui may be an ex Dee but he was a ‘Terror’ to the Falkirk defence and looked hungry for a goal. Fasan saved twice from him early in the second half then again when he made a run from half way which resulted in a shot brilliantly saved low to his right by the former Celtic stopper. Aidan Connolly and Andy Ryan both had shots hit the side netting as the half progressed with Falkirk not at the races. Their first real and indeed only attempt came when Patrick Brough shot wide from 18 yards. Fasan then denied El Bakhtaoui again shortly after with another fine save. Dunfermline brought on Myles Hippolyte much to the dismay of the Falkirk support who let the ex-Bairn know their feelings. Hippolyte was then immediately involved forcing Fasan in to another great save. The Falkirk keeper had done his utmost to keep his side in the game and produced another fine save from Hippolyte when he palmed his shot upwards and off the cross bar before being cleared. However the Dunfermline pressure finally paid off and Hippolyte secured the points on 89 minutes. He did not celebrate against his former club but the visiting support certainly did as the home fans made their way to the exits after another disappointing day.